Welcome to the Ebrahimi Bio-Electronics (e-Bio-e) Lab at Penn State University. Our mission is to devise innovative platforms, especially using low-dimensional materials, for healthcare-related applications. We have a Bottom-Up approach: exploring the underlying science (material properties and biology/microbiology) and leveraging them to advance engineering solutions (device physics/engineering and spectroscopy techniques). [04/12/2019] Congratulations to Rikki for winning the 1st place in CERS 2019! His poster presentation was on “Printable Electrochemical Biosensors for Application in Flexible Point-of-Care Diagnostics”. [03/25/2019] An article about our recently-awarded research project is featured on Penn State News. [03/08/2019] Our lab received a CoE Multidisciplinary Research Seed Grant. Thank you! (Link to PSU News). [03/01/2019] Congratulations to Lindsey for receiving the 2019 Erickson Discovery Grant! This is a highly prestigious research grant awarded to ~ 70 undergraduate applicants in College of Engineering across all PSU campuses. [02/25 & 27/2019] Dr. Ebrahimi gave two talks at MRSEC Seminar Series and Engineering Science and Mechanics Department’s Graduate Seminar. [12/10/2018] Dr. Ebrahimi delivered an invited talk and served on a panel (Sensor Commercialization – Challenges and Opportunities) at the Sensors Summit conference in San Diego. [11/07/2018] Derrick presented his recent research progress at the NSF: ATOMIC semiannual meeting at Houston, TX. [10/24/2018] Keren presented his work at the Materials Day 2018, Penn State University. [10/17/2018] Dr. Ebrahimi was invited by the National Graphene Association to serve on a panel (Future of graphene in Medical devices and Telemedicine) at the Global Graphene Expo & Conference in Austin, TX. [09/20/2018] Dr. Ebrahimi is organizing and chairing a special session in BMES 2018 in Atlanta, GA. The session is on “Application of Two Dimensional Materials in Healthcare” with three invited speakers from Georgia Tech, University of Pennsylvania, and University of Texas at Austin. Join us if you are there! [08/30/2018] Congrats to Keren for receiving the Milton and Albertha Langdon Memorial Graduate Fellowship! [08/14/2018] Adam, Keren, and Tunan have joined our group. Welcome! [07/25/2018] Dr. Ebrahimi delivered a talk to high school students at “Anything is Possible for Girls in Electrical Engineering (APGEE)”. It was a successful 5-day camp, tailored for girls interested in STEM. [07/25/2018] Our lab host a Research Snapshot as part of Science & Leadership Camp (hands-on research experience) for high school students. They learned about electrochemical sensors for monitoring neurotransmitters and made a sensor to detect dopamine! [07/11/2018] Our group organized a Science Booth (2D Carbon Conduction) at Art Fest. It was a full morning of science and learning with more than 600 attendees. [07/10/2018] Chengye’s and Rikki’s works got accepted to BMES Annual Meeting, Atlanta, October 2018. [07/06/2018] Dr. Ebrahimi delivered a talk at NSF MRSEC’s summer event for REUs and RETs. Thanks for the kind invitation. [07/01/2018] Ebrahimi lab received a seed grant from Medical School, MRI, and Huck Institute to develop a novel rapid antibacterial susceptibility testing method. [06/12/2018] Dr. Ebrahimi presented our work on in situ monitoring of E. coli metabolism in the 28th World Congress on Biosensors in Miami. [05/14/2018] Derrick received the prestigious University Graduate Fellowship (UGF). UGF recognizes top-rated applicants in the College of Engineering. Congratulation, Derrick! 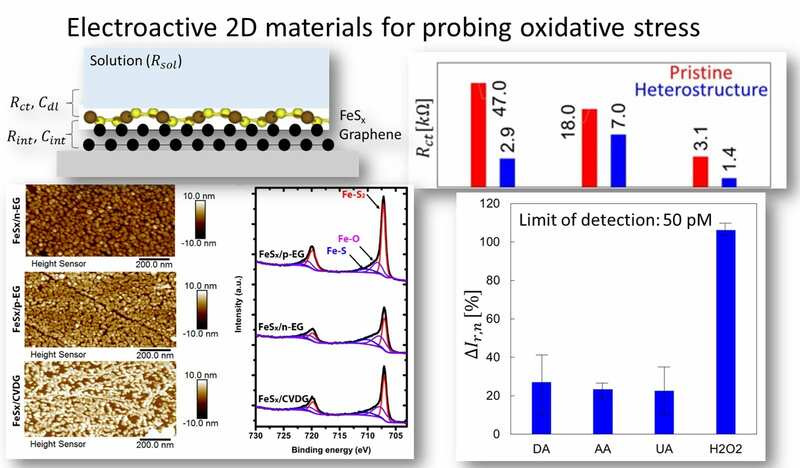 [05/07/2018] Our proposal to NSF-IUCRC ATOMIC center to study Fenton-based biosensing and catalysis using 2D materials has been funded (PIs: Robinson and Ebrahimi). [05/01/2018] Derrick joins our group to pursue his PhD studies in EE. Welcome! [04/24/2018] Rikki successfully presented his Senior Design Project on Dynamic Laser Speckle Imaging of Bacterial Cells in the EE Project Fair, Spring 2018. [02/16/2018] Our paper entitled “Gel-integrated impedimetric biosensors based on Au-Ni microelectrodes enable in situ detection of E. coli metabolism” got accepted in “28th Anniversary World Congress on Biosensors“. 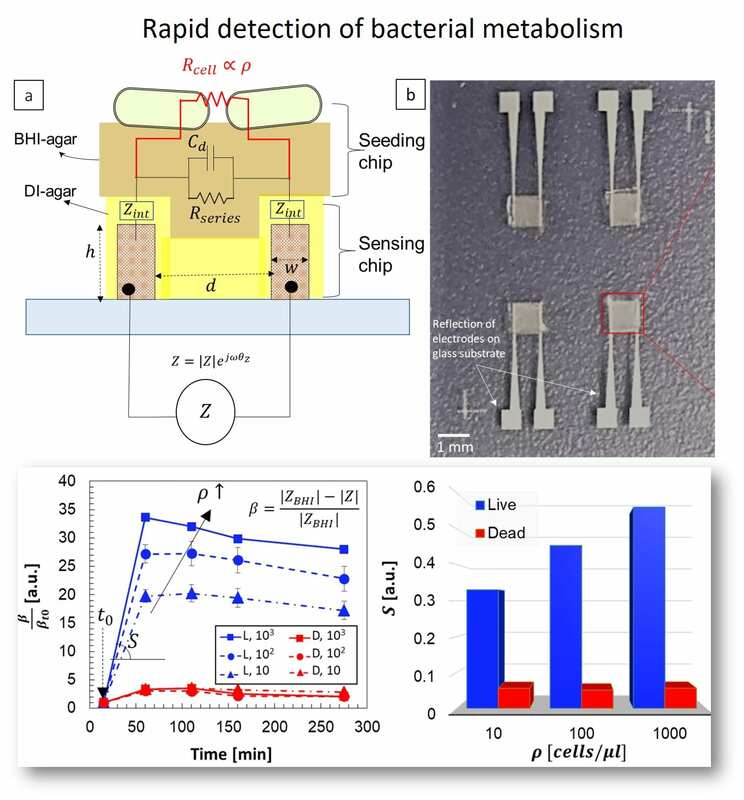 [02/06/2018] Our paper published in Biophysical Journal, entitled “Analyzing Thermal Stability of Cell Membrane of Salmonella Using Time-Multiplexed Impedance Sensing”, is the Top Story on NSF Science 360. [12/11/2017] Huck-MRI’s Common Vision is supporting our proposal on real-time study of bacterial communication. [11/1/2017] Our paper on Electrical analysis of Thermal Stability of Cell Membrane of Salmonella just got accepted in Biophysical Journal. [10/18/2017] Our proposal on 2D Material-enabled Antibacterial Susceptibility Testing got the Merit Award from MRI-Covestro. Thank you! [10/17/2017] Dr. Ebrahimi is presenting her research in Materials Day, Millennium Science Complex, PSU. [10/11/2017] Dr. Ebrahimi is attending the BMES annual meeting in Phoenix, AZ. [09/21/2017] Dr. Ebrahimi is invited to give a talk in EECS colloquia. [08/10/2017] Possible Grad and Undergrad research positions are available. [08/10/2017] e-Bio-e website is launched. Welcome!